Maria Tallchief is a world-renowned ballerina and one of the premiere (first-ranking) American ballerinas of all time. She was the first American to dance at the Paris Opera and has danced with the Paris Opera Ballet, the Ballet Russe, and the Balanchine Ballet Society, later renamed the New York City Ballet. 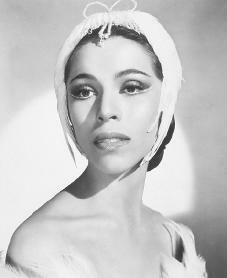 Maria Tallchief was born in Fairfax, Oklahoma, on January 24, 1925. Fairfax is located on the Osage Indian Reservation. Her grandfather had helped negotiate the treaty (agreement) that established the reservation and kept the tribe's right to own any minerals found on the land. When oil was discovered on the reservation, the Osage became the wealthiest Native American tribe in the country. Maria's father, Alexander Joseph Tall Chief, an Osage Indian, was a wealthy real estate executive. Her mother, Ruth Mary Porter Tall Chief, was of Scottish and Irish ancestry. Eliza Big Heart, her grandmother, frequently took young Maria and her sister, Marjorie, to the ceremonial tribal dances. Tallchief began ballet and piano lessons at the age of three and frequently performed before civic organizations in Osage County. By age eight she and her sister had exhausted the training resources in Oklahoma, and the family moved to Beverly Hills, California. Although her mother hoped she would be a concert pianist, Tallchief devoted more and more of her time to dance. At one of her performances she devoted half of her program to the piano and half to dance. By age twelve Tallchief was studying under Madame Nijinska, sister of the great Russian ballet dancer Vaslav Nijinsky (1890–1950), and David Lichine, a student of the renowned Russian ballerina Anna Pavlova (1882–1931). When she was fifteen years old, Tallchief danced her first solo performance at the Hollywood Bowl in a number choreographed by Nijinska. Following her graduation from Beverly Hills High School in 1942, it was apparent that ballet would be Tallchief's life. Instead of college she joined the Ballet Russe de Monte Carlo, a highly acclaimed Russian ballet troupe based in New York City. She made her debut with the company in Canada. It was at this time that Marie Elizabeth Tall Chief changed her name to Maria Tallchief to give herself a more European image. Initially Tallchief was treated with skepticism (uncertainty) by members of the Russian troupe, who were unwilling to acknowledge the Native American's greatness. When choreographer George Balanchine (1904–1983) took control of the company, however, he recognized Tallchief's talent. He selected her for the understudy role in The Song of Norway. Under Balanchine, Tallchief's reputation grew, and she was eventually given the title of ballerina. During this time, Tallchief married Balanchine. When he moved to Paris, France, she went with him. As had happened with the Ballet Russe, Tallchief was initially treated as an inferior in Paris. Her debut at the Paris Opera was the first ever for any American ballerina, and Tallchief's talent quickly won French audiences over. She later became the first American to dance with the Paris Opera Ballet at the Bolshoi Theatre in Moscow, Russia. She quickly became the ranking soloist and soon after joined the Balanchine Ballet Society, now called the New York City Ballet. At the New York City Ballet Tallchief became recognized as one of the greatest dancers in the world. When she became the prima (lead) ballerina, she was the first American dancer to achieve this title. She held that title for eighteen years, until she retired. Tallchief left the New York City Ballet in 1966. She went on to found the Chicago City Ballet in 1981. She also served as the artistic director of that company through 1987. Tallchief had formed a strong relationship with the Chicago art community when she danced in a production of Orfeo ed Euridice with the Lyric Opera of Chicago in 1962. Tallchief was presented with a National Medal of the Arts award by the National Endowment for the Arts in 1999. Browne, Vee. Maria Tallchief, Prima Ballerina. Parsippany, NJ: Modern Curriculum Press, 1994. Tallchief, Maria, and Larry Kaplan. Maria Tallchief: America's Prima Ballerina. New York: Henry Holt, 1997. Gourley, Catherine. Who Is Maria Tallchief? New York: Grosset & Dunlap, 2002. Lang, Paul. Maria Tallchief: Native American Ballerina. Springfield, NJ: Enslow, 1997. This biography was amazing! I wanted to know about Maria Tallchief and I couldn't find information anywhere but here. I now know a lot about Maria Tallchief! I saw Maria Tallchief dance in Frankfort while we were stationed in Germany in 1956-57. She was simply breathtaking! i really like the information that is given about maria. this is the first website that had lots of information about maria. the other websites didnt really tell most of her life story,but this website did.that is why i will always use this website to find biographies about people tha are important in history. wow! now i know a lot about her. but when did she die? il est souvent étonnant d'apprendre que des gens disparaissent, parce que vous les avez bien connu, ici le fait est que j'ai moi-même dansé avec cette grande dame à Hambourg , en Allemagne, lorsque j'ai commencé ma carrière dans un ballet de son mari" les quatre tempéraments", le pas de deux de sanguin magnifique ballet avec une merveilleuse partenaire. Elle était d'une simplicité remarquable etune artiste à vous couper le souffle…Merci Maria, je pense souvent à toi, comme à étoile qui scintille dans mon cœur.